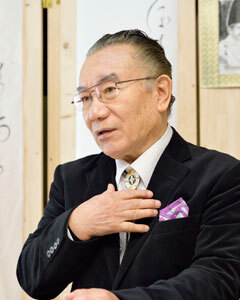 It was this photo of Tsuchiura-based physician Dr. Junichi Saga – prolific writer, artist and environmental activist, that appeared in the local “Joyo Living” newspaper after it was announced that Bob Dylan had been awarded the Nobel Prize for Literature. Many people in this area (Tsukuba, Tsuchiura an Ushiku) remember how back in 2003, it was discovered that Dylan had used several passages and phrases (14 to be exact) from Saga`s work “Confessions of a Yakuza” (as translated by John Bester) in the lyrics of his highly acclaimed album “Love and Theft” (2001). The Nobel Prize is a big deal in Japan. More so, it seems to me, than in other countries. Every autumn you can sense the anticipation in the air – and people actually talk about it – will any Japanese win this year? For a long time there has been talk of best-selling author Haruki Murakami being awarded the Literature Prize. And though Murakami is not as popular or beloved in Japan as he is abroad, most Japanese still root for him to win the prize. Like an Olympic medal, they would consider it another proud feather in their national cap. If they ask my opinion on the matter, I usually say the same thing. – something like: “Sure, It`s possible for him to win – there`s really no way of predicting who they`ll choose”. But to their dismay, I then go on to add that I hope he doesn`t get the prize. I say that I enjoy his novels and all – in fact some of them are hard to put down (despite being very hefty tomes). What takes his Nobel-worthiness away in my eyes though, is the fact that he is such a commercially successful writer who uses the same formula and themes again and again. With so many lesser known and greater writers in this wide world (Phillip Roth and Joyce Carol Oates to name only the Americans) I just don`t think Murakami deserves it. 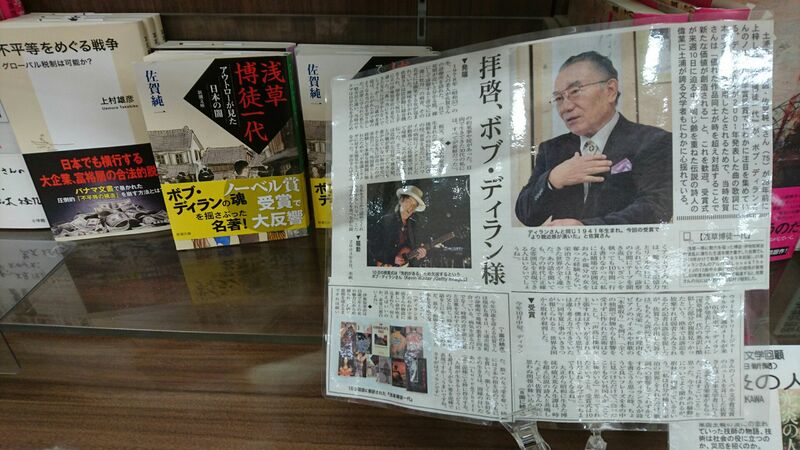 Then, when I`ve finished opining, I always made sure to add, that if a Japanese writer were to be selected for the Nobel Prize for Literature (and two – Yasunori Kawabata and Kenzaburo Oe, already have) it should be none other than Dr. Junichi Saga of nearby Tsuchiura City! Like two more of my favorite writers – Anton Checkov and Oliver Sacks, Dr. Saga, is a physican. He was born and raised in Tsuchiura City, Ibaraki Prefecture (his house is about 15 minutes by car from Tsukuba Center) where he continues to practice medicine. Despite his very busy “day-job” though, he has created over the years, an amazing oeuvre of literary works consisting of more than a dozen books, hundreds of essays – and an opera libretto. It was Dr. Saga`s reaction to the whole controversy though (as reported by the Wall Street Journal), that left the greatest impression (especially to the people living in this area at the time). When asked whether he was going to sue for plagiarism or not, the good doctor said ” Certainly not ! It`s an honor to be copied by such a great man!” Or something like that. The incident was covered by the New York Times and other major papers as well. “Confessions of a Yakuza” John Bester`s translation of Saga`s” Asakusa Bakuto Ichidai” is the story of Eiji Ijichi, a former Yakuza boss who in his old age became one of Dr. Saga`s patients. 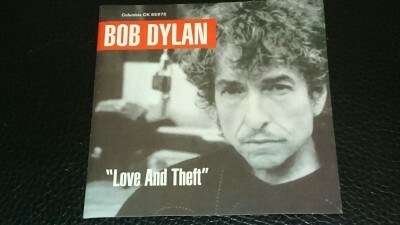 Back in 2003, a 22 year-old English teacher living in Kita-Kyushu, a native of Minnesota named Chris Johnson, was browsing through the book and noticed one particular phrase – “My old man would sit there like a feudal lord….” It reminded him of the words in Dylan`s song “Floater”: “My old man, he’s like some feudal lord” from the album Love and Theft, that we`d been listening to repeatedly. 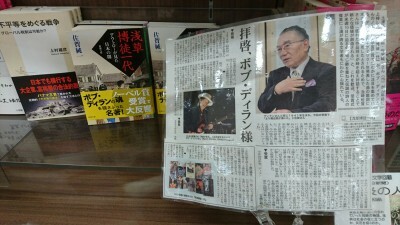 He then went on to find other similarities between the album and the English version of Dr. Saga`s book. 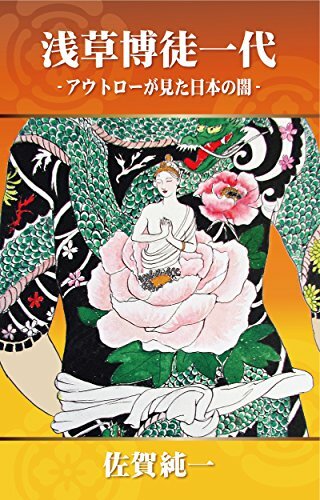 The Japanese version of what in translation (by John Bester) became “Confessions of a Yakuza” – it has been translated into several foreign languages – and after Dylan`s Nobel it is going to come back into print in Japanese! That`s why I found it so ironic, when Dylan so unexpectedly won the prize (unexpected in the sense that as a lyricist he was not really thought of as a “candidate”) When “The Complete Lyrics of Bob Dylan (Winner of the Nobel Prize)” is published, it will contain in it, a tiny trace of Dr. Saga – a man that I have long felt should be a winner of the prize ! Of course, I don`t mean to take anything away from Dylan`s astounding achievements – in fact, he was the first artist to really move me when I reached puberty – I`ll never forget when I hearing his voice for the first time – (I mean REALLY hearing it, not like I had as a small child on my parents record player) – it a passionate wailing – from the car radio, in the parking lot of the Sherwood Diner. It was an awakening of sorts….the first stirrings of something deep down inside me… and his songs continued to move me for decades to come (and over the years my own feeble attempts at songwriting have usually been influenced by him!). His early works showed me how to rage against injustice, his next stage not to get so worried about it – or take anything all that seriously – his album blood on the tracks prepared me for the terrrible anguish of heartbreak – and his “born-again” phase that ANYTHING could happen! And after that, well it has just been an inspiration that at his age he can still keep come up with a great new song every once in a while. So I don`t mean this post to be a knock in any way on Bob – and Dr. Saga has nothing but warm feelings for the Bard of Bleeker Street – and the fact that they were born in the same year deepens the feeling of affinity. It`s just that Dylan`s Nobel Prize has brought Dr. Saga and his mostly out of print works back into the spot-light – and since all publicity is good publicity( as we now know after the Trump campaign)- I`d like to take this opportunity to promote the works of this deeply humane writer who has dealt with a very wide range of topics and themes- and whose writing displays a very distinctive sensiblility. In fact the last two Nobel Laureates before Dylan, Mondiano and Alexievich, seemed to me lesser versions of Saga. 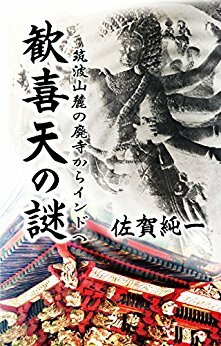 The blurb from Amazon.com : Over 50 reminiscences of pre-modern Japan-illustrations of a way of life that has virtually disappeared. 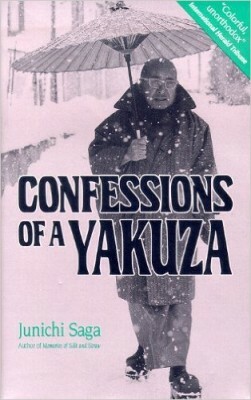 Voted “Best Book of the Year” by Japan’s foreign press. This is a collective biography, based on interviews taped by a small-town doctor, recording the lives of a cotton dyer, blacksmith, tofu maker, undertaker, carter, tenant farmer, local gangster, casual laborer, horse-meat butcher, magistrate’s wife, apprentice geisha, rice merchant, thatcher, carpenter, midwife, county hangman, pawnbroker, draper, fisherman, hairdresser, servant, charcoal burner, and so on-over fifty in all. Their memories are all related to a lakeside town and its rural suburbs northeast of Tokyo. 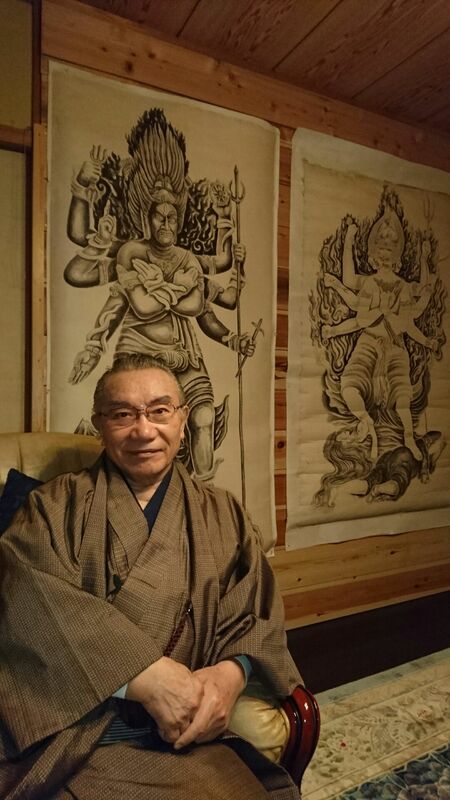 Born in the early years of this century, these people have both seen the old Japan and lived through the changes brought about by modernization and the onset of affluence. In a real sense, they provide the sole surviving links with a feudal way of life and its attitudes which have altered, in the space of fifty years or so, beyond recognition. Through plain-spoken anecdote-their voices by turns amused, nostalgic, disturbing but unsensational-they describe their youth in a tougher world where poverty was commonplace, where unwanted children were sometimes “thinned out” at birth, where poorer families cooked out-of-doors and fishermen in summer went almost naked. By saving their memories for posterity, the author hoped to close, just a fraction, the gap in perception between a traditional past and the Japan we know today. The result-as the distinguished anthropologist, Ronald Dore, says in his preface-is “a book to savor, and a book to learn from.” These reminiscences are accompanied by illustrations painted by the author’s father, Dr. Susumu Saga-themselves a record of an old man’s past. 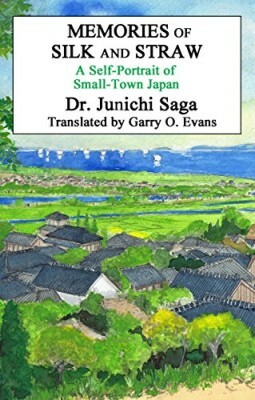 While in previous works Dr. Junichi Saga has summoned up the voices of his elderly patients to bring back to life a now vanished, “pre-globalized” Japan, here the internationally acclaimed author turns his attention both closer to home, to his own father, Susumu, and further afield, to a family drama that spans 3000 miles, from a rustic hamlet on the shores of Lake Kasumigaura (Japan’s second largest) to Irkutsk, on the shores of Lake Baikal in Siberia. The appearance of a long-lost photograph, helps get father and son talking, and 77-year old Susumu’s memories flowing – scenes of early 20th century Japanese village life, the once thriving lake-port town of Tsuchiura, cosmopolitan Harbin in Manchuria, the border town of Manzhouli, Irkutsk in the dead of a Siberian winter during the Russian Civil War (1919-1922), and the long train rides between. 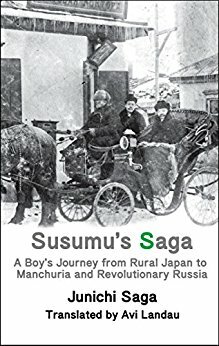 Susumu recalls what had happened 70 years earlier so vividly and in such detail that his son can hardly believe what he hears. 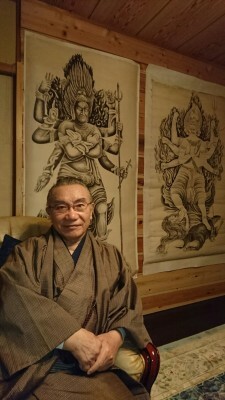 However, visits to the National Archives and some rigorous (pre-Internet Age) research, turn up material that confirms much of what the old man says – and provides a much fuller picture of what was going on in the world that Susumu had lived in – but could hardly make sense of: at the age of eight…. a complex world filled with Radicals (Bolsheviks), anti-Radicals (“Whites”), Chinese warlords, Czechoslovak legionaries, freed Austrian and German POW`s, Japanese soldiers and settlers, drifters, bandits and spies. Blurb from Amazon – “When I close my eyes, all I see is clear, bright water.” So remarks one of the people whose memories, told in their own words, make up this record of a vanishing way of life in small-town, lakeside Japan. 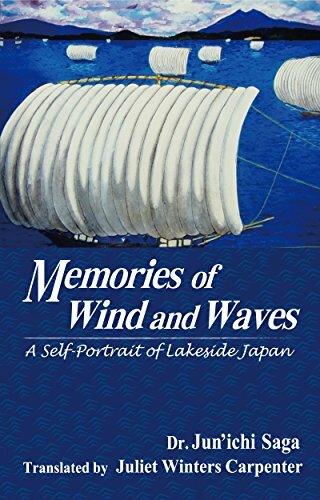 “Memories of Wind and Waves” gathers the richly detailed stories of thirty-three elderly men and women who spent their lives working on or around Japan’s second-largest lake, Kasumigaura. Though just forty miles from Tokyo, the area was throughout much of the twentieth century very rural and poor – a world away from the capital that we know today. Many people tell of working late into each night in a struggle to survive, supplementing their main livelihood from fishing with a bit of farming or other work. Yet these are people who lived so close to nature – in some cases literally on the lake – that a great many of their reminiscences are not about hardship but about just how beautiful the place was. Through this rare, rich oral history we come to know a world very different from our own, inhabited by people like the woman who was married off at nineteen to a riverboat captain and was “steaming mad” to find there was no toilet on board the ship where they were to live, and that she was expected to stick her rear end over the side to relieve herself; or Catfish Kyubei, who, when he dived underwater to catch catfish with his bare hands, stripped completely naked first, to make his body as cold as the fishes’ so they wouldn’t sense his presence. Since the lives of many of the storytellers actually span the twentieth century, these people have been witness to remarkable changes, with much of the work they once did by hand and in extremely difficult conditions having now been industrialized, mechanized, or made obsolete. They take great pleasure in remembering a time when the lake and the lives of the people around it were more closely intertwined. Their stories present a little-known, very human face of modern Japan and, perhaps more importantly, deal directly and in a plainspoken way with the issues that concern us all – family, work, love, and memory. Can You Tell me About the War? 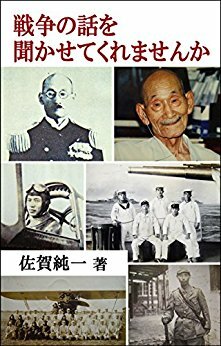 A collection of reminiscences by Japanese, both men and women, who experienced the war in various ways. I have finished a translation and it should be available at Amazon within the next couple of weeks. 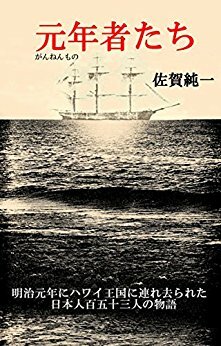 “The Mystery of the God of Bliss” is a fascinating exploration of the Indian and Chinese roots of certain elements of Japanese culture which were later suppressed by the modernizing Meiji government of the late 19th century – I have also finished translating this work and it should be available in English at the beginning of next year. The Gannen Monotachi – the first 153 Japanese who went over to work in the Kingdom of Hawaii in the first year of the Meiji Era (Meiji Gannen). They came to be called the Gannen Mono (People of the First Year Year of Meiji) bu later genreations of Japanese immigrants. This is their story This book was turned into an NHK radio drama. And my favorite Dr. Saga work, about growing up as a delicate and precocious child in a small lakeside village in early 20th century Japan.